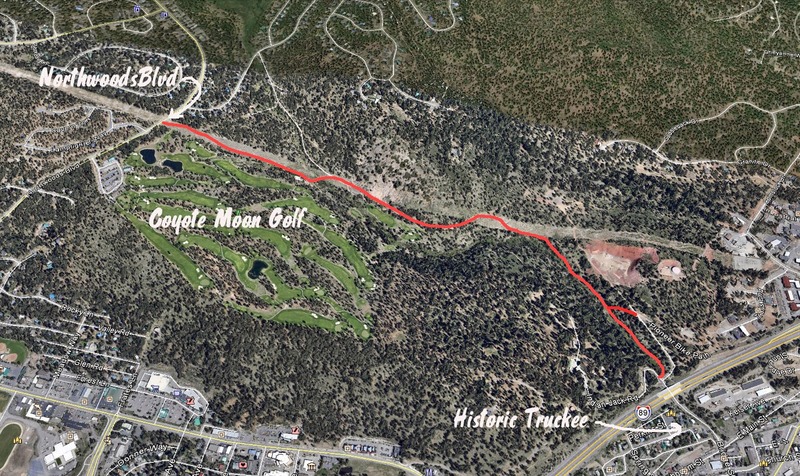 The Town of Truckee is continuing implementation of the Bikeways Master Plan by accepting bids on Phase 1 of the Trout Creek Trail. The Trout Creek Trail will link Northwoods Blvd. to Truckee’s historic downtown. Phase 1 also includes a connector trail approximately 430 linear feet long that connects to the existing Pioneer Commercial Center bikeway. The new paved recreation trail will begin at the north of end of Bridge street near I-80 and link to Euer Valley Road and then Northwoods Blvd. The trail will be built in two phases for funding considerations and acquisition of right-of-way. Phase 1 will begin at the north end of Bridge Street and end near the Coyote Moon Golf course on Euer Valley Road. Phase 2 will include trailhead parking near Northwoods Blvd. and the Coyote Moon Golf Course. Two route options are possible for Phase 2. Both routes will cross Trout Creek. One plan calls for using an existing culvert and the other will require a new 80 foot bridge. The trail will consist of a trail bed 10-14 feet wide, with 8-10 feet of paved surface, and 1-2 feet of dirt shoulder on each side of the pavement. The Town of Truckee received 6 bids for Phase 1. The bids ranged from $1.1 to $1.5 million dollars. Construction is expected to begin by May 2015.